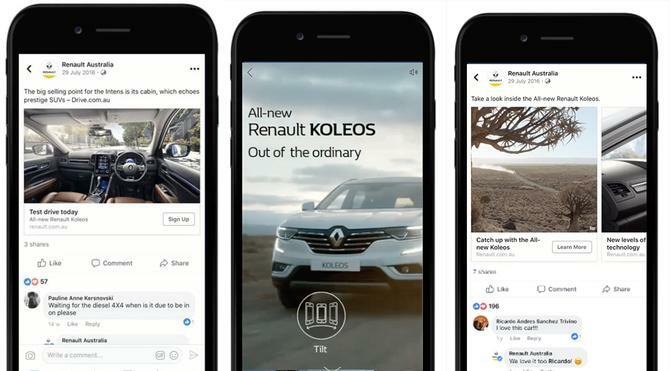 Renault Australia is conducting a pilot with Facebook to give dealers a complementary role encouraging prospects down the purchase funnel after experiencing strong success across the social media platform. The car manufacturer’s local digital, CRM and customer experience leader, Lauren Smith, told CMO investing into Facebook/Instagram and a mobile-led digital marketing strategy is part of ongoing efforts to build the brand’s footprint in the Australian market. While Renault is well-known globally and part of the world’s largest automotive alliance (Renault/Mitsubishi/Nissan), the brand is a challenger in the local market and has been working to build awareness and consideration through digital means. As recent as four years ago, the brand had no robust digital strategy for the local market, Smith said. Renault’s agenda is to be present and relevant in all touchpoints in the customer journey across devices, mindsets and platforms, Smith said. The team has been ramping up investment in channels such as Facebook, Google and Carsales to make this a reality. “Our approach to digital media is a full funnel one, working in an aligned way with offline activities,” she said. The decision to invest in social media advertising kicked off in July last year with the introduction of the Koleos SUV. Australia was the first market globally to debut the new model. The six-month campaign on Facebook resulted in a reach of 3.4 million, more than 1100 leads, and a 40 per cent conversion to dealer test drive. Smith said the cost per lead via social was also more efficient than the next-best performing lead generation tactic. With a cross-funnel and cross-device mentality, Renault used video to complement its broadcast TV efforts, then worked to re-engage people in order to drive consideration, employing assets such as Facebook Carousel ads. It then used specific targeting criteria to drive inquiries from people interested in buying a car. Renault also invested in Facebook and Instagram to launch its latest Megane small car in late 2016, reaching an audience of 2.6 million, chalking up 841 leads and resulting in a 35 per cent conversion to dealer test drive. Smith said 45 per cent of webpage visitors were driven from Facebook from 8 per cent of total media spend. Through all of this, one of the biggest lessons Renault’s team has had to learn is how to embrace creative for a mobile-first approach. A big change, for example, is shifting away from creating 15-second or 30-second stories, to developing customised videos for the small screen. Smith’s team has experimented with short-form video, gifs, editing styles and lengths, testing and optimises continuously. “Changing the approach of the team is a long-term effort to try and shift away from a TVC–centric mindset of adapting communications to digital formats, to being customer centric, and engaging based on where that customer is and the mindset they might be in,” Smith said, adding short-form video also gives the brand the flexibility to adapt, iterate and optimise creative assets quickly. Because of the transparency of digital activity ROI on sales, Smith said her team’s approach is now filtering into other areas of the marketing team. Phase two of Renault’s social media strategy will see it invest in similar campaigns for its latest Clio and Captur launches, and Smith said it’s also applying an always-on approach to its commercial vehicle range and dealers.Overall, Facebook represents 7 per cent of total online spend. With a strong focus on providing dealer network with digital marketing support, Smith revealed her team is also conducting a pilot with Facebook on a program that is not only designed to ensure the brand is speaking to customers in a relevant way, but that also puts in place a solution for Renault dealers to use social media effectively to drive a sale. The pilot launches next month and is a partnership with 11 Renault dealers aimed at driving local area awareness and leads, which will complement the broader national level brand activity, Smith said. "We will take the learnings from that pilot then optimise from there. We take a similar approach with our other key digital platforms and partners," she added.